The fourth instalment of the live action franchise of the Hasbro toy line has the distinction of being filmed entirely on IMAX 3D cameras. For what it's worth, it's truly a visual wonder, making the CGI effects less stomach churning than the last efforts in this ongoing series. The screenplay by Ehren Kruger takes place four years after Transformers:Dark of the Moon. It features a new set of human characters to interact with the Autobots to save the world. It also features the Dinobots, another reason for some major toy marketing by Hasbro. Cade Yeager (Mark Wahlberg) is a struggling inventor/single father living in rural Texas with his 17 year old daughter Tessa (Nicola Peltz). They are going to lose their farm if dad doesn't get his act together as Tessa is graduating and they need funds for college. Cade had found an old truck when salvaging equipment and while trying to repair it discovers that it is Optimus Prime (voiced by Petter Cullen) who was injured and hiding out. The government and the public which has been made paranoid by CIA Director Harold Attinger (Kelsey Grammer) xenophobia. He believes the destruction of Chicago in the last movie is the reason the world should not trust any alien robot. An award is being offered for any information on the hiding Autobots. Unfortunately Cade's best friend and assistant, Lucus (T.J. Miller) calls in the discovery hoping to help out Cade from being evicted. Except all hell breaks loose when the CIA black ops unit “Cemetery Wind” aided the Transformer bounty hunter Lockdown (Mark Ryan) come raining terror on the farm and Optimus is forced to fight. The CIA boss has ulterior motives in this quest to find all transformers. 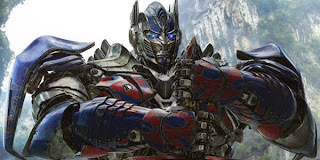 The captured Autobots and Decepticons are being used for their metal Transformium by Kinetic Solutions Incorporated (KSI) run by Joshua Joyce (Stanley Tucci) the arrogant inventor who wants to build his own Transformers. Attinger's evil plot will reap a part of the profit as his backdoor parachute. Joshua has created Galvatron who he is forced to activate to chase down Optimus Prime and the handful of surviving Autobots: Bubblebee, Hound (John Goodman), Crosshairs (John DiMaggio), Drift (Ken Watanabe), and Ratchet (Robert Foxworth). Lockdown captures Optimus Prime and inadvertently Tessa is caught too in their spaceship. Cade and Tessa's race car driver boyfriend Shane (Jack Reynor) find a way to help her and the Autobots to save Optimus. The action then moves to China to escape the bad PR generated by the battles. Turns out there's this seed that everyone is after that will turn the land into Transformium. The Autobots and human helpers are determined to keep it safe. Poor Hong Kong gets completely destroyed in the epic battle between Galvatron and the other prototypes that were infected by Megatron's evil programming. Obviously outnumbered Optimus releases a group of legendary knights (Dinobots) to help save the day. Phew. A lot of stuff happens in this movie which in the IMAX theater rumbles the seats with it's thunderous volume. It's non stop action with bits of humor and personality by the Autobots and the humans. The dialogue is cartoonish with lines like when Galvatron vexes “Impossible! They are ruining everything!”. Visually it is outstanding and this will be the summer blockbuster filling the theaters no matter what. But best of all Shia LeBeouf is not in it. I realize the Transformers is routinely harped on by true critics; but I have always found them very well made and they do well coming up with storylines. Granted, it always ends with robots battling robots; but I didn't pay to watch a movie of Strawberry Shortcake. People who like these movies know what they want, and this series delivers a high quality product.